I'm having some problems finding the morph injections I have in daz studio inside carrara. I'm seeing PhillW tutorial, and it seems very simple to load them... if you are able to find them. Already looked over all the folders in content and there isn't anything with morph injections... In the tutorial he uses a runtime library created by him... I just have the default ones, but that includes the "My DAZ 3D Library Runtime", so the morphs should be there... I think... Or do I need to do some kind of thing to have access to the morphs? 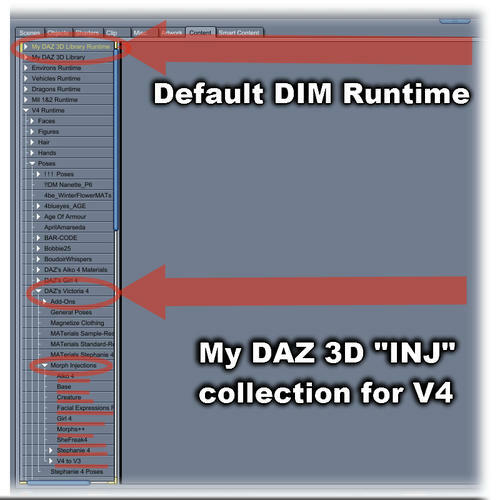 If you use DIM to install everything to one folder, for example, use the "My DAZ 3D Runtime Library" in the Content browser, go to Poses, and you'll find any INJ files you've installed under their product names in there. EDIT: In the example image below, I show where they are located in my custom "V4" runtime, since I don't have any INJ files in my default DIM directory. But the location will be the same, but in the directory I've illustrated with the top arrow, if you just use the DIM default. Otherwise, any custom runtime folder that you might have, again... the location will be the same. Note that Genesis and Genesis 2 don't use INJections for morphs. They are added to the base figure upon installation. I actually went again looking for it.... nothing... there's really no morphs injections on my library... Actually, my runtime library is really different and the only daz characters that appear like that are genesis, genesis 2 female and genesis 2 male.... All the other characters just appear in smart content... Really strange thing.... I'm really having hard time since in victoria 5 (I don't have 4) and in girl 6 no clothes conform, even when they are made for that character... Also with materials - most of them don't work. Okay, that's what's going on. INJ files are made for earlier figure releases. Genesis changed all of that. For now, use DAZ Studio to load the clothing onto the figure, and set the materials how you want them. This goes for Auto-fit clothing as well. Do this part in DAZ Studio. Then in the scene tab of DAZ Studio, select each item separately and save them back into the library, using a new name. I use the same place where I found them. save in the folder where you found it, perhaps in a new folder if you like. I just use the same folder, but change the name a little. Hmmmm.... ok, that makes sense... Most of my content is for genesis 2 and my characters are all genesis 2 based. If you've purchased Carrara "Pro",. you should also get V4 and M4 with the morph packs, in the bonus content. I think that's why Phil-W is using them as an example. I know that I did, but I don't know if Carrara 8.5 came with that stuff. I think that's why there was the lower upgrade price. Instead of Generation 4 stuff, 8.5 gives you a whole new 8.5 content download with some pro goodies for M5 and V5, which is some really nice stuff. I think that we needed to buy Carrara 8 to get the DAZ bundle that came with that. I don't think they truly accumulate from one version to the next. But I could be wrong. Ah yes... I just checked my product library. Victoria 4.2 Base, morphs ++, etc., came with my purchase of Carrara 7 Pro and my purchase of Carrara 8 Pro only. To get the piles of content that came with them, you could look into getting an inexpensive version of Carrara's past versions. RK has a great list of resources here, at Carrara Cafe and, toward the top of the list are magazines that come with Carrara 7 Pro and other goodies. I bought this book (Figures, Characters, and Avatars - by Les Pardew) from DAZ, but is now available at Amazon (Besides the content on disc, the book is cool, too). The version shown below is the version I bought, and it came with Carrara 6 Pro and Hexagon and a pile of free content. The book is about DAZ Studio, and also comes with Studio 2.3 on the disc, but the information in the book goes well for any software you use. Any of these methods, if you contact DAZ 3D customer service, and explain (probably prove) your purchase, they'll update your product library, I think. Personally, I love the Generation 4 figures. But I'm quickly switching to Genesis 2 for their obvious superiority. I often daydream my way through Amazon, looking at the earlier versions of Carrara - dreaming of the thought of collecting them all to create a shelf of nostalgia in my Carrara office. This idea also makes me wonder what sorts of goodies I would get along the way. The disc that came with this book came with all sorts of stuff from the Carrara 6 portion of the disc. Free example HDRI, and other resources. Just fun. My pleasure. But I'm actually just trying to return the courtesy that 3dage and the rest of this community did for me when I was new. As you've noticed, 3dge has just returned. He was a strong force when I got here as was NASSOS, Sub7th, Dimension Theory, Age of Armour, McGuyver, and many, many others and really helped me get my head on straight. So I'd like to thank you for asking questions that I can attempt to sort out. I love it! I also find myself researching questions that I don't know right off hand, but have an idea or two... so I go in and experiment to find the answer. So helping others is also a great way to learn more and more as I go along. In truth... I guess I sort of live on this forum. I have virtually no other internet activities. No FaceBook, I don't game much at all, except for a few good oldies... I just shop DAZ 3D and hang out in the forum. Wel, V5 and M5 are morph packages... and some of the really top-notch ones at that. Look in the Parameters tabs of both Genesis and Actor to see all of the morphs you have installed. Once I started playing with Genesis 2, however, I've soon discovered the improvements for which morphs are located under Actor, and that the Pose morphs are all under the character's name instead. It makes it a lot easier to work with for me. So for Character morphs, textures and clothes, I've been focusing mostly on Genesis 2 male and female. I have all of the major offerings, like V6, M6, Girl6, Teen Josie... I think I have them all - the ones released officially by DAZ 3D. And then I try to grab as many expressions as possible. I still need to grab M4 and V4 for Genesis 2, which will give me the ghost clone for auto fit options. I am very excited about how real this new generation looks, and how easy they are to work with. About the thread subject, and as a newbie to 3d, I'm already a genesis 2 generation :P Love the 6 generation characters. Yeap, think that for that kind of monster characters there's no substitute for genesis 1! ;) It's really great!! I keep trying to get myself to use DS more for just this purpose, and more. So yesterday I actually did some of it, and find Studio to be an excellent Character creation package. I don't really care for keyframe animation in it, but that's probably because I'm just not used to it. So I just leave that part for Carrara. I am a huge Carrara fan, as you know... but I like these other tools too! Thanks for pointing that out, though. It really is nice, doing the shaping and such directly in DAZ Studio. Now I just need to experiment with saving a character in DAZ Studio that is fully clothed, with hair. I'm sure it's just as easy, and will end up just like loading any other character in Carrara... Fun!!! Thank you!! :) I will try to put the skin in daz 3d store. Could really get some extra money... it would be a big help... Let's see how it goes, still have to make a nice render for that. Hexagon does not work in my operative system. :( It's really sad that daz never update it again. I really like using various softwares. If one is better than another in one particular thing (and sometimes better just means we like it more for some reason), it's great that we can use all of them. Don't really understand why there isn't a bridge from ds to carrara to. another software I want to learn is zbrush, and ds has a bridge to zbrush to, even if it is not from daz. About saving, don't know how you do it, but I really dress and pose the character with expression and all, save normally in ds and then just open the .duf in carrara. it's the good thing about this 2 softwares. you may save it as a character of course, but I've been doing like this (in my one day experience :P ). Then I save as .car of course. Working from the .duf does not seem the most stable way to work inside carrara. 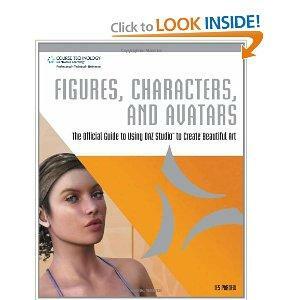 another software I want to learn is zbrush, and ds has a bridge to zbrush to, even if it is not from daz. Carrara also has a direct bridge "GOZ for Carrara" to Z-Brush. Working from the .duf does not seem the most stable way to work inside carrara. you're right. it's not a good way to work. Q: Are you using "Textured Mode" in Carrara's Viewport ? this should show the texture maps and allow you to see the changes you make to morphs better than the default Gouraud mode. I understand what you mean, and agree... but curiously, if you open the duf (it's not very stable) then save as car, close and open the car file, it works pretty good, as far as I could notice with one day trial. :P I read somewhere that carrara 8.5 actually was improved in this matter of using DS files. But of course I can also do the characters in daz, save them as characters and open them directly in carrara. With time I will see what works better for me. ;) I love carrara and daz, so I will work with both a lot and will for sure learn by experience the pros and cons of every method. In this case really think I should try both and see how it works. dragging DS materials onto items in Carrara just don't work, but if you do that in DAZ Studio, save it to the library, and open in Carrara from the library, it does work. So they're close... just needs some tweaking. Truthfully speaking, I'm a bit surprised that we haven't received an update for 8.5 yet. More bummed than surprised... but surprised nonetheless. What was the point of the 8.5 work to get genesis in there,. Why update the FREE DS to support that new figure,. I'm Not purchasing anything from this place until that's resolved. Dim was introduced to make supplying updates easier and more efficient ... they should use this. Carrara is a great software, and the most expensive from daz. But it seems like is the one who is put apart from other softwares... As I said before, if they have a bridge to hexagon and bryce (2 softwares that are not updated for so long that new operative systems like mine can´t handle them), and they even have a bridge to softwares that don't belong to daz... why not have a bridge to carrara?? It would create a great workflow I think. And I didn't knew this thing about G2 until now, but it actually deserved an update to deal with this new figures. I've been trying to match the seems from the skin I showed you above... It's a nightmare... I'm painting in the texture maps on photoshop and it's almost impossible to make everything match perfectly. I was looking around the net and I found that Blacksmith 3d is a software just for 3d painting. It seems very nice, but I for now I don't have money for it. Then I stumble on "carrara 3d painting". Didn't knew we had a 3d paint with brushes and all inside carrara!!! My question is, the texture maps are already done and I really love the skin as it is, I just want to corrects the seems. (Don't know if you use photoshop but wanted a kind of healing brush effect so that the seems were corrected). Can I do that inside carrara or just work painting from scratch on a blank surface? I mean, can I 3d paint on already made texture maps?? Daz3D did work on ways to transfer scenes to carrara from DS,. There have been several attempts at making DAZ Collada (DAE) and other options to transfer stuff. DUF seems to be the most stable and reliable method so far. The problem with direct transfer to carrara is that Daz Studio uses plug-ins , lighting systems, Cameras, and shaders which Carrara can't handle. This works both ways,. ...it's impossible to transfer plants, landscapes, oceans etc to DS and still be editable in DS. With Hexagon,. you're only transferring the selected model, to a Modeller, ..and back again. With Bryce, Which was rebuilt to support daz studio transfer, the DS Scene is loaded into Bryce from DS,. (DS and AFAIK, not editable / animate-able in Bryce directly,. that has to be done in DS, before transfer. Daz3D then created their own software (daz Studio) when "Poser" was going through a period of being sold to other companies. since their entire market place for "Content" was originally established for the "Poser" Market. That's why most of the "Content" sold here will work in Poser and daz studio, and you'll find options for Poser export in DS. Carrara is not like DS or Poser,. since Both of those programs "Depend" of being able to load content. Carrara can create it's own content, and can be used without any Daz3D products. The paradox is that "Content" sales from the store, fund the development of all the Daz3D software products. can I 3d paint on already made texture maps?? You can use the 3D paint directly in Carrara, and save as PSD (photoshop). DS doesn't have Direct 3D paint,. Just the Bridge to Photoshop.